The Hotel Aquila d'Oro offers its guests many services, including the new Horus Spa on the attic floor, a play corner for children, free parking, WI-FI and much more. Small pets are welcome. 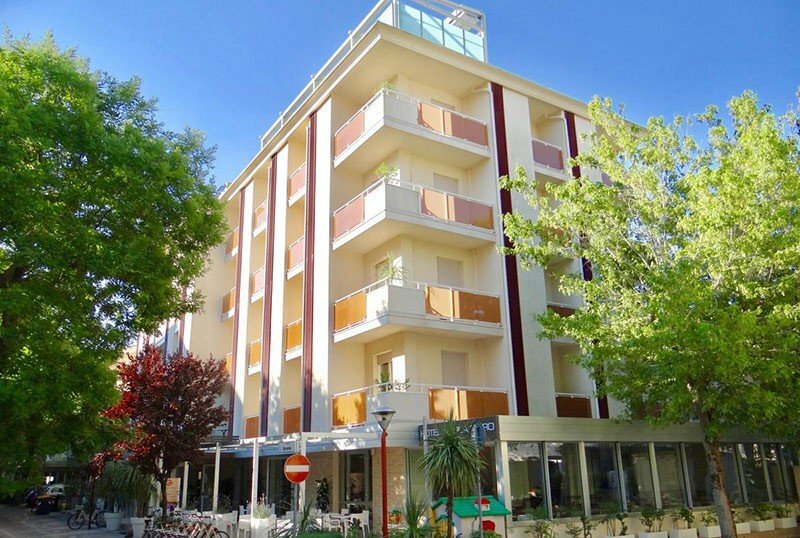 The hotel is located in Misano Adriatico, a few dozen from the seafront and the beach, easily reachable by a short walk. The rooms are equipped with balcony, air conditioning, WI-FI, minibar, electronic combination safe, telephone, TV 21 '' with Sky Vision Gold (June, July and August) and private bathroom with hairdryer. CLASSIC : double or twin with French balcony. STANDARD : single, double / twin or even quadruple. The balcony is upstream or side. SUPERIOR : large sea side balcony with clothesline. The room can be double / twin, triple or quadruple. Garden, free use of bicycles, large living room, lounge bar with daily newspapers and satellite TV, children's play corner, lift, wellness area with solarium, garden terrace, private tennis court near the hotel, paid laundry. The staff organizes theme nights. PARKING: covered and uncovered; both available subject to availability (100 meters from the hotel). CONVENTIONS : beaches, amusement parks, shuttle service. BREAKFAST : buffet with jams, muesli, fruit juices, mixed cold cuts, yogurt, croissants and homemade desserts. LUNCH AND DINNER : three choice menus with fish every day, buffet of appetizers, vegetables and salads. At dinner choice of fresh fruit, dessert, ice cream and sorbet. Water, wine and soft drinks all inclusive. OTHER: every Thursday Romagna dinner with typical dishes. In hotel: indoor playground area, pediatrician and baby sitter on request. In the room : cots, deckchairs, shower boxes equipped with a flexible multi-jet shower. At meals : child seats, baby food, flexible hours, baby menus agreed with parents. Those staying in All Inclusive mode will find the beach service included in the price. 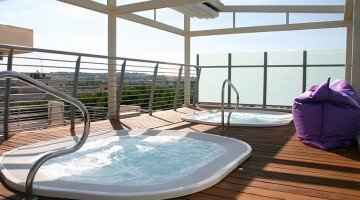 The hotel has an agreement with: Bagni Tilde and Virgilio, number 1 Riccione, and, in Misano Adriatico, Bagno number 2 Speranza, Bagni Calypso, numbers 3-4-5-6-7, and Bagni Margherita, numbers 10 and 11. The prices of the price list are per person per day for a min. 7 days. TOURIST TAX: Excluded from the price list. € 0.80 per day per person for a maximum of 7 consecutive nights, excluding children up to 13 years. For those staying in May, June or September, a free entry is included for each adult to our Wellness Center with whirlpool, sauna, emotional showers and relaxation area. Offer children free in June 0-10 years if sharing room with two adults! Offer Children Free Misano Adriatico from June to September. For a minimum stay of 6 days full board, a child up to 6 years in room with two adults is FREE! Take advantage of this offer now, call for a quote! See our special offers for Spring Bridges holidays on the Adriatic coast! Summer 2019, come on vacation 7 days All Inclusive in Misano Adriatico! Special offer for the first week of July! 7 days in full board + drinks with meals, prices per person.